Happy brains are productive brains. Happy people make more money and do better work.They have a wider scope of attention, they see issues and risks sooner. They are more productive, sociable, energetic, cooperative, creative, resilient, successful and engaged. They are healthier and live longer. 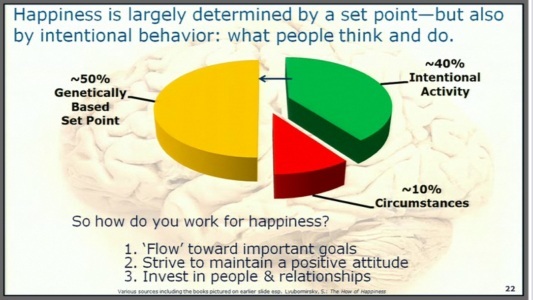 Happiness is about 50% genetic, 10% circumstances and 40% intentional (controllable) activity. To work for happiness: Flow toward important goals-Set goals, make and measure progress toward goals. Make goals that use your strengths. Finding and fixing weaknesses is not the way to go. When managing people, find and use strengths in yourself and your team. Flow-skill and challenge meet at a high level, just enough brain to do this task so you really have to focus on it. You get in the zone, just you and the task. Flow is one of happiest and most productive states of mind. Don't distract yourself with multi-tasking, it breaks flow. Strive to maintain a positive attitude-Be actively optimistic. Write down the best possible future (for self, team, etc.) Pay attention to positive things in your life. The best (most productive) teams have a ratio of positive to negative comments of 5:1. 3:1 or better ratio minimum to build good teams, keep people in positive frame of mind. Invest in people and relationships-#1 indicator for happiness in people's lives is the quantity and quality of the relationships they have. Ti boosts coping ability which reduces stress, boosts happiness. Happiness is contagious.